The International Space Station's robotic arm, under the control of astronaut Karen Nyberg, reached out and snared a Japanese resupply ship Friday after the unmanned cargo carrier completed a smooth laser-guided rendezvous with the 450-ton orbiting complex. Loaded with 3.6 tons of gear to bolster scientific research and keep the space station running, the H-2 Transfer Vehicle is the fourth logistics craft Japan has sent to the space station since 2009. Nyberg, in her third month aboard the space station, locked on to the HTV cargo craft with the lab's Canadian-built robotic arm at 1129 GMT (7:29 a.m. EDT) as the vehicles flew 260 miles over above Earth south of Africa. "Houston, station," Nyberg radioed mission control. "Capture is complete. I'd like to say congratulations to the entire JAXA team and everybody else around the world who has successfully gotten the fourth HTV to the International Space Station." "Karen, and the rest of the Expedition 36 crew, congratulations," replied veteran astronaut Mike Fincke inside mission control in Houston. "Tsukuba (mission control in Japan) sends their thanks and congratulations. Down here, we see a successful grapple and capture of the Kounotori cargo vehicle. Good work." The HTV is nicknamed Kounotori, or white stork in Japanese. Over the next several hours, ground controllers maneuver the 58-foot-long robot arm to position the HTV cargo craft on the Earth-facing port on the space station's Harmony module. Final berthing to the Harmony module was complete at 1538 GMT (11:38 a.m. EDT), when 16 bolts drove into place to create a firm attachment between the automated cargo carrier and the space station. 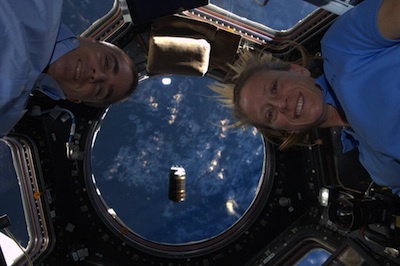 The astronauts plan to open hatches between the HTV and Harmony on Saturday, before floating through the 50-inch-diameter pathway into the cargo craft's pressurized compartment to begin unloading supplies. The HTV's cabin is filled with 1,257 pounds of water bags, food supplied by Japan and NASA, clothing, shampoo and other treats for the space station's six-person crew. Other payloads with more technical purposes include a freezer to house sensitive experiment samples in Japan's Kibo laboratory module, oxygen tanks for spacesuits, rechargeable batteries, and a system to monitor the environment inside Kibo. The cargo ship also delivered life science experiments studying plant growth and freeze-dried sperm from a mouse to look at the effects of spaceflight on animal reproduction, according to a JAXA press kit. Four small satellites known as CubeSats are also inside the Japanese cargo craft. The CubeSats, which were built by institutions in Japan and the United States, will be deployed from a specially-designed apparatus on the end of a Japanese robot arm outside the space station. A talking humanoid robot named Kirobo is packed inside the HTV. And an ultra-high definition video camera was delivered to record imagery of comet ISON as it flies through the inner solar system late this year. NASA also shipped new equipment for the space station's satellite refueling testbed aboard the HTV. The dry cargo inside the HTV totals 4,094 pounds, according to NASA. 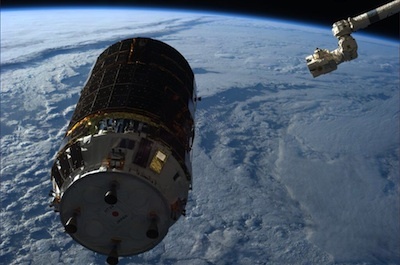 Japan builds cargo delivery vehicles to pay for its share of the space station's operating costs. The Japan Aerospace Exploration Agency, or JAXA, plans to fly at least seven HTVs through 2016. The first three HTV flights were successful. "We have gained trust to the point NASA has requested us to transport indispensable supplies for operating ISS with Kounotori," said Dai Asoh, an HTV flight director at JAXA's Tsukuba Space Center. The Kounotori 4 mission delivered 3.6 tons of cargo - mostly inside the ship's pressurized cabin. On Sunday night, U.S. time, ground controllers will begin a choreographed maneuver using Canadian and Japanese robot arms to extract a cargo pallet from the HTV's unpressurized payload bay. The pallet will be temporarily positioned on the Japanese lab module's exposed porch, where the robot arms and Canada's Dextre robotic handyman will move three boxes from the HTV pallet to new homes on the space station. The HTV's external bay holds a main bus switching unit - a device used to distribute electrical power on the space station - and a utility transfer assembly designed to route cables between the outpost's four solar array truss segments and pressurized modules. The switching unit and transfer assembly will be stored outside the space station to serve as spares in the event of failures with either system. The HTV's exposed pallet also carries a U.S. military payload housing eight experiments in atmospheric observation, thermal control, radiation measurement, data processing and lightning research. The instruments, sponsored by the Defense Department and NASA, will be installed outside the space station for several years. Later this month, the robotic arms will put an old experiment package on the HTV's pallet before placing the cargo-carrying cradle back inside the supply freighter for disposal. Astronauts will also stow trash inside the HTV's pressurized compartment. Departure of the Kounotori 4 spacecraft is scheduled for Sept. 4, with re-entry set for three days later over the Pacific Ocean. The HTV is designed to burn up in the atmosphere at the end of its mission.